Formerly known as Siam, this Southeast Asian country changed its name to Thailand back in 1939 when centuries of absolute monarchy came to an end. Since then, the country has alternated between parliamentary democracy and military junta. The latest military coup came in 2014, and political instability continues to loom over the country. To make matters worse, the beloved King Bhumibol passed away in 2016 after 70 years as the head of state. To put it lightly, the Thai people aren’t exactly fond of his son and successor. Government problems aside, Thailand remains a great choice as a travel destination. The Kingdom of Smiles has been a favorite of travelers for decades, and for good reason. From the sandy beaches of the islands, to the culture and history of ancient cities, to the madness of Bangkok, to the colorful Buddhist temples, to the wild and mountainous north, a trip through Thailand can have a ton of variety. Get crazy at the Full Moon Party on Koh Pha-Ngan, explore the ruins of Ayutthaya, experience some of the best scuba diving in the world, temple and bar hop in Bangkok, or go on a jungle trek up in Chiang Mai. In short, if you can’t have a good time in Thailand, then you’re probably not a very fun person. 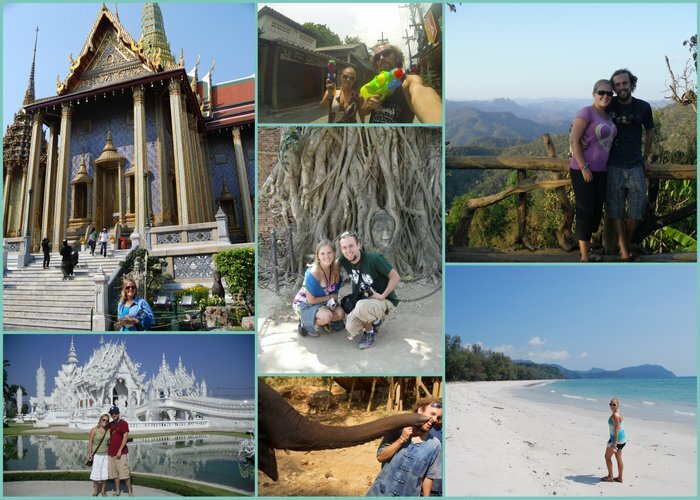 We have Thailand to credit for sparking our love of Southeast Asia and backpacking in general. It was during a month-long trip here and to Laos back in 2011 that led us to pursue more long-term travel and to eventually travel through the entire region on our gap year. Thailand will always hold a special place in our hearts, and it’s a country we’ll never get sick of visiting. In fact, it’s high up there for countries we could eventually see ourselves “settling” in, if that ever happens. Having spent two months traversing the country overland, we’ve got plenty of stories and tips to share. Full of stunning temples, bustling markets, mouth-watering cuisine, and wild nightlife, Bangkok is probably our favorite city. It can be a bit intimidating to first-time visitors, though, so we put together a great guide to 3 days in Bangkok to help you out. When it comes to adventure in Thailand, nothing beats riding the 1,864 curves of the Mae Hong Son Loop. Rent some wheels in Chiang Mai and spend at least a week exploring national parks, waterfalls, caves, villages, and so much more. It’s one of the best travel experiences we’ve ever had and we know you’ll love it, too! When it comes to backpacking the Banana Pancake Trail, there are a few quintessential stops – Angkor Wat in Cambodia, in the tubing in Laos, and of course, the Full Moon Party on Ko Pha-Ngan. Every month, 30,000 revelers descend on the beach for a night of absolute lunacy. Follow our 10-step guide to ensure that you have an awesome time and don’t end up facedown in the sand without your wallet or phone! Chiang Mai is the 2nd biggest city in Thailand is often referred to as the northern capital. It’s probably the top destination worldwide for digital nomads, and it’s one of the most popular places to visit in the country. Start planning your trip with our guide to 10 things to do in Chiang Mai. Some places just steal your heart right away and make you want to give up all plans and just stay forever. Pai was one of those places for us. With tons of outdoor adventures, great nightlife, and a chilled out vibe, this hippie Mecca in Thailand is our kind of place. We’re working on tons of content from our adventures around Thailand, so be sure to check back regularly. In the meantime, why not explore some of the country’s neighbors? Laos, Myanmar, and Cambodia are all nearby and are all fascinating destinations in their own way.